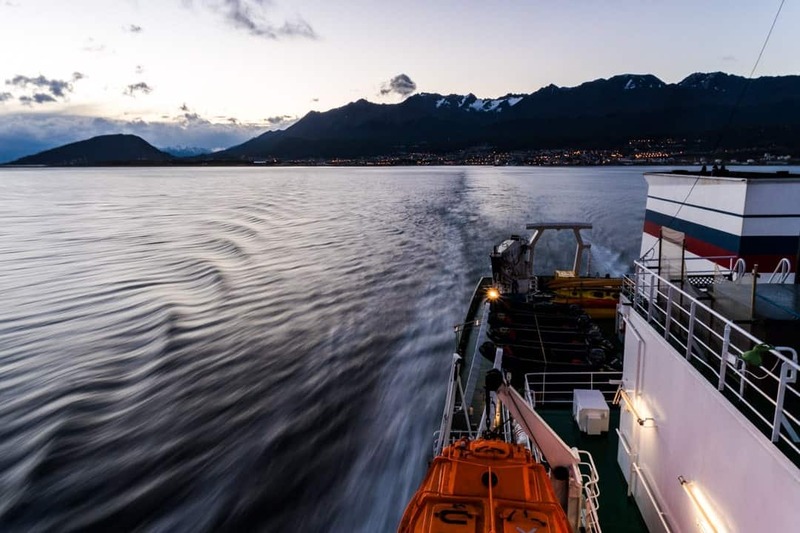 What it’s really like crossing the Drake Passage from Ushuaia to Antarctica. The Drake Passage, the stretch of water between the southernmost tip of South America and the South Shetland Islands of Antarctica has the notorious reputation of being the roughest seas in the world. For centuries sailors would venture in trepidation through the stormy passage, pushing their ships and skills to the limit. 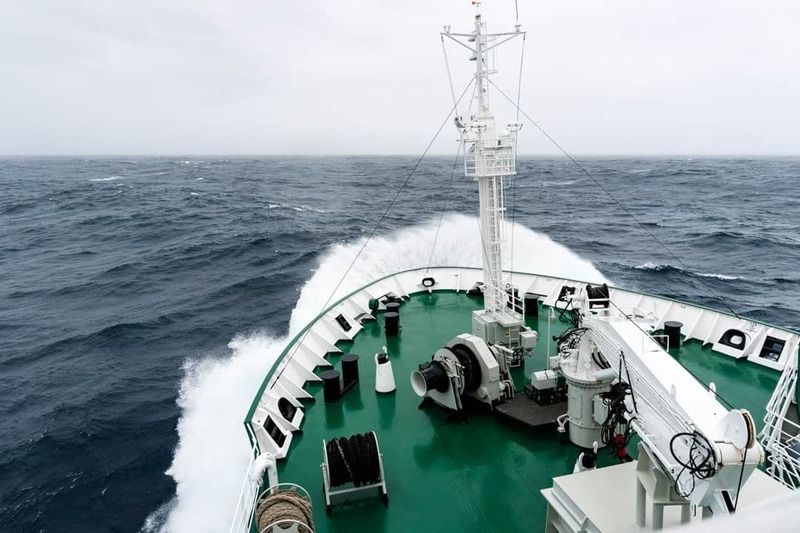 But is crossing the Drake Passage really as bad as it sounds in today’s climate? Every year the thousands of tourists that make the passage from South America to Antarctica on expedition and cruise ships are rewarded with one of the most incredible adventures on this planet – a visit to the ‘White Continent’. For some people the idea of spending two days at sea in potentially rough conditions is enough to deter them from making their journey to Antarctica. Based on our own personal experience, this fear is unwarranted. Check out our comprehensive list of the most epic things to do in Antarctica! We crossed from Ushuaia to the Antarctic Peninsula on a Russian research vessel in 2017, and experienced ‘Beaufort 9’ winds (on a scale that goes to 12). Despite the shaky passage we felt completely safe, even if we did get a little motion sickness. Since we have returned from Antarctica we have been asked dozens of times, “What is it like crossing the Drake’s Passage?” The short answer: Not as bad as you think. Today the crossing is far less treacherous compared to the early days of exploration, thanks to advanced ship construction and modern satellite and weather monitoring technologies. It is important to remember that the fearful reputation that the Drake Passage has mainly stems from the dangerous crossings that sailors made in wooden ships, without the aid of GPS and weather forecasts. Yes, the seas can be rough. And yes, some people get sea sick. But no, it is not scary or dangerous anymore. 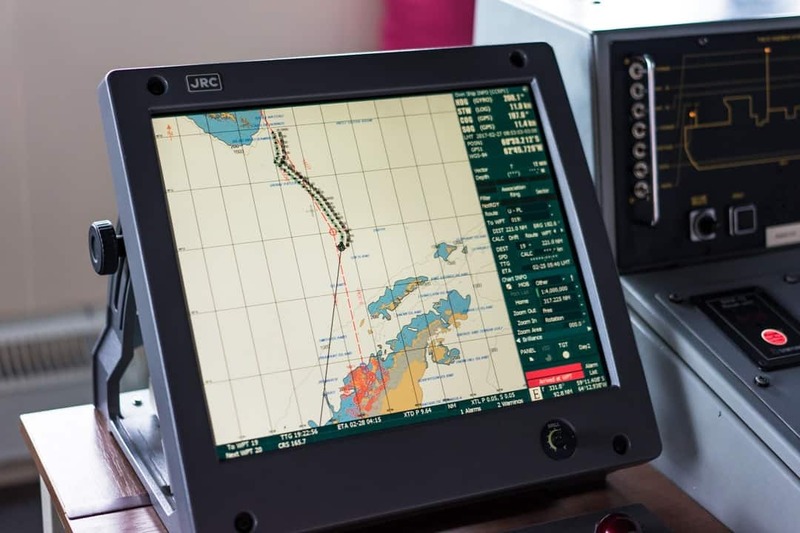 The navigation chart on the bridge, as we cross the Drake Passage. The history of exploration in the Drake Passage goes back nearly 500 years. This stretch of sea is where the Southern Ocean surges through an 800km-wide gap between the tip of South America and the Antarctic Peninsula, creating a sometimes turbulent environment. The Drake Passage is also known as the Mar de Hoces (Sea of Hoces) in Spanish. The English title was named after the British explorer Francis Drake, whose ship was blown south of the Magellan Strait at the bottom of South America in 1578. It wasn’t until 1616 that the first documented crossing of the Drake Passage was made, when the Dutch vessel Eendracht rounded what later became known as Cape Horn. Since then the Drake Passage has become infamous with sailors as home to some of the roughest seas in the world, and a badge of honour to be worn for those that have crossed it. As the narrowest passage connecting Antarctica with the rest of the world (in this case South America), it is the primary route taken by tourist expeditions to visit the southern continent. Standing on the bridge, watching waves break over the bow over the Akademik Ioffe. 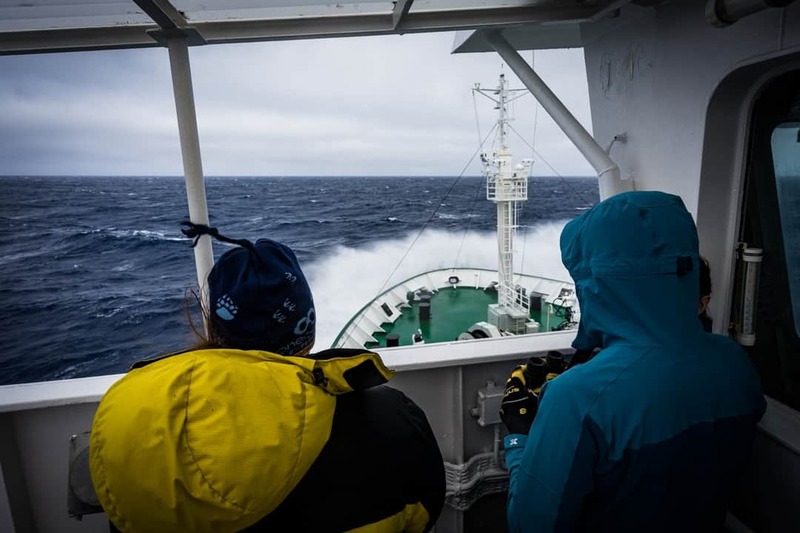 We crossed the Drake Passage on the Akademik Ioffe, a Russian research vessel operated by the polar region tour experts, One Ocean Expeditions. 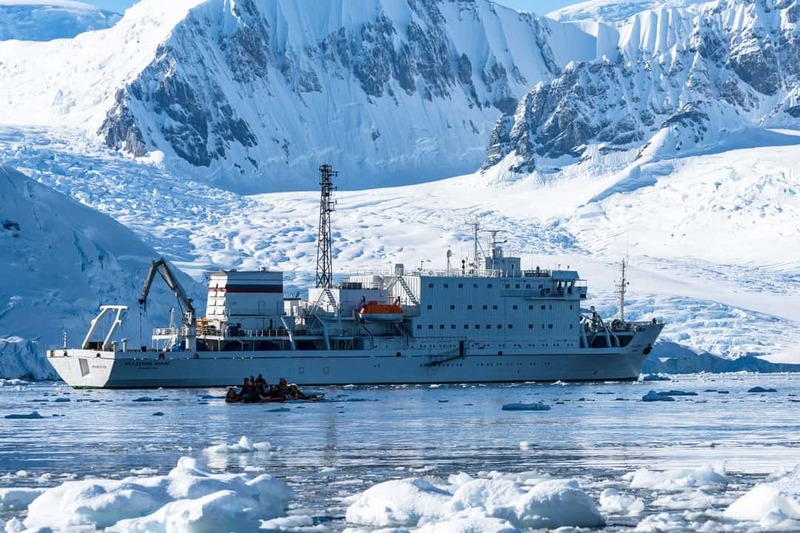 This ship, along with its sister-ship the Akademik Sergey Vavilov, were built in 1989 and 1988 respectively in Finland and were constructed to be the most capable polar exploration vessels that have ever sailed the seas. Armed with an internal water-ballasted stabilisation system and an ice-strengthened hull, under the command of an experienced captain and crew with thousands of hours at sea, we knew that we would be perfectly safe on our journey. This wasn’t a cruise ship that you might find in the Mediterranean or the Caribbean – this was a vessel designed to conquer anything that the ocean could throw at it, while conducting important scientific research. If were to put our trust in any ship for crossing the Drake Passage, this was the one. Learn how to travel to Antarctica responsibly in our ultimate guide. The Akademik Ioffe in Antarctic waters. The best ship to get us through the Drake Passage. After a few days in Ushuaia we were scheduled to start our Antarctic adventure on February 25th. We met the crew and fellow passengers in a stylish hotel for check-in then headed to the port to embarkation. We were taken to our rooms, had a detailed safety briefing and shown how to use the life boats and life jackets (in the extremely rare circumstance that we would actually need them). All 67 passengers felt excited and fully-prepared for the journey south. As luck would have it a storm had formed over the Drake Passage during the day, and the captain made the decision to delay our departure in order to avoid the worst of it. Already the comfort of the passengers was being put as a priority. We left port at 10pm, and when we woke in the morning we were officially in the Drake Passage. The sun rose and the ship came to life. The seas were rolling yet steady, and spirits were high amongst the passengers. Over breakfast Boris Wise, our experienced expedition leader, warned that the seas ahead were looking rough, but that this ship and the captain had made far more intense crossings countless times. With Boris’s confident outlook all the passengers felt much more at ease. Personally we were excited to experience what is commonly known as the “Drake Shake“. Most of the group had come fully prepared for the voyage, loaded up with a huge amount of seasickness medication such as Dramamine and Benadryl. Every One Ocean Expeditions journey has an experienced doctor onboard. For us it was Dr Gabby, and she was constantly on hand to administer any stronger medication if needed, and monitor how everyone was feeling. Just before lunch Alesha and I started to feel a little sick, and Dr Gabby gave us some tablets to quickly ease the nausea, then some strong patches to be put behind the ear that would eliminate any seasickness for 3 days. They worked a treat, and within an hour we were up and running around the ship again. The winds picked up and soon the Akademik Ioffe was swaying with the swell. The crew locked the doors to the outside decks to make sure no one wandered outside while the seas were rising. 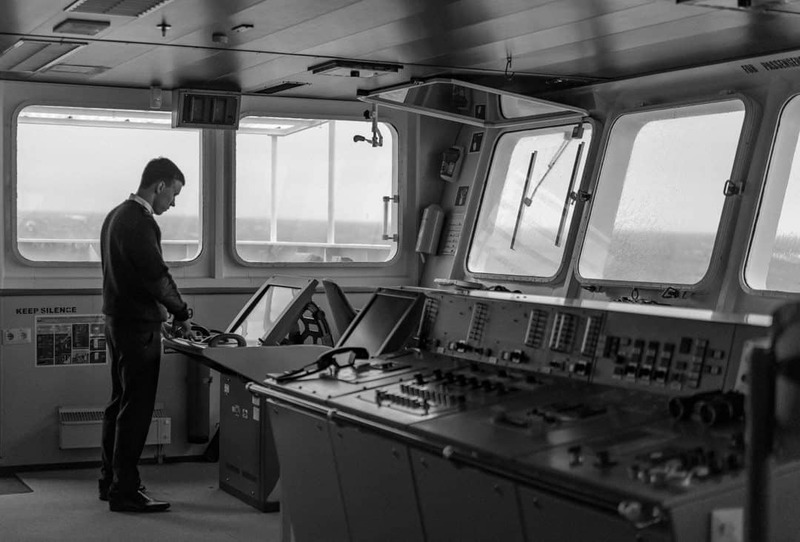 On the upper deck the captain and officers had opened the bridge, giving everyone access to spectacular views over the stormy seas and distant horizon. Now and then a wave would break over the bow, creating a dramatic scene that just about everybody wanted to photograph. Sea spray blowing over the bow. This was also the only place to get fresh air while the storm doors were closed (unless you opened the porthole window in your room), so the passengers happily congregated on the bridge watching the helmsman expertly guide the ship through the waves. While it did get progressively rougher throughout the day and night, by then everybody onboard had taken their medication and most were feeling fine. The Drake Shake rocked us as we motored towards Antarctica, but even with the Beaufort 9 winds and rising swell, the mood on the ship was positive and excited. We chatted to many of the guests on the ship who were initially worried about this crossing, and all of them admitted that it wasn’t as bad as they imagined (despite feeling ill for a short time). 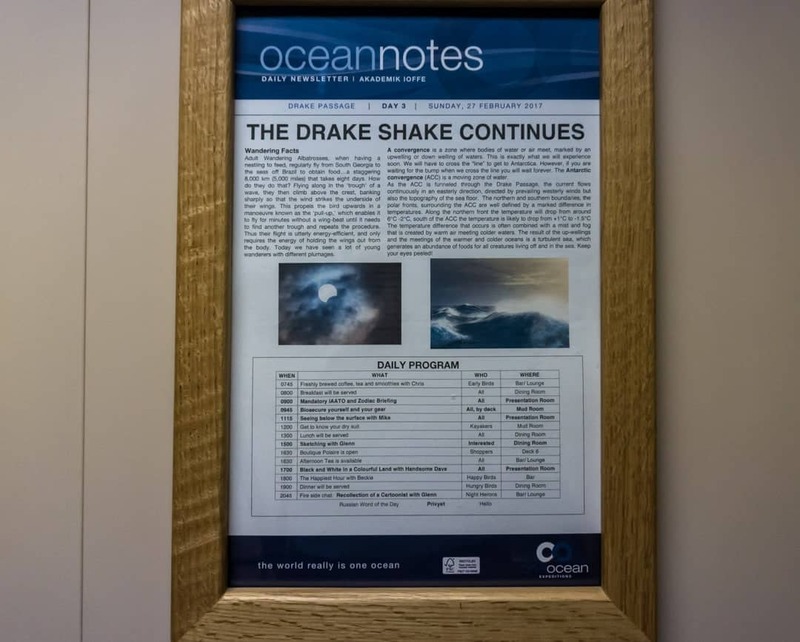 Even the One Ocean Expeditions crew admitted the seas were rough, which actually made us all feel a lot braver for charging through the Drake Shake without a care in the world. The daily bulletin for the ship on the second day – The Drake Shake Continues! Two days at sea goes by surprisingly quick onboard the Akademik Ioffe. Hearty and delicious meals are served throughout the day, and there is ample time to read up on Antarctic history in the well-stocked library. Those feeling active can hit the gym or sauna, or if you’d rather relax the lounge is always open with a selection of herbal teas and coffee to enjoy. Some people simply chilled in their rooms, but by far the most popular thing to do while crossing the Drake Passage is to attend the presentations. One Ocean Expeditions employs a number of world-class specialists to greater enhance the onboard experience, such as polar historians, ornithologists, whale experts and even a professional photographer. These experts give regular presentations to educate passengers on the environment, wildlife and history of Antarctica. Each session lasts between 30 to 60 minutes, and are extremely rewarding. We honestly felt our Antarctica expedition was greatly enriched by these presentations. In the evenings Happy Hour would commence, and most people headed to the lounge for an alcoholic (or non-alcoholic) beverage to ease into dinner. 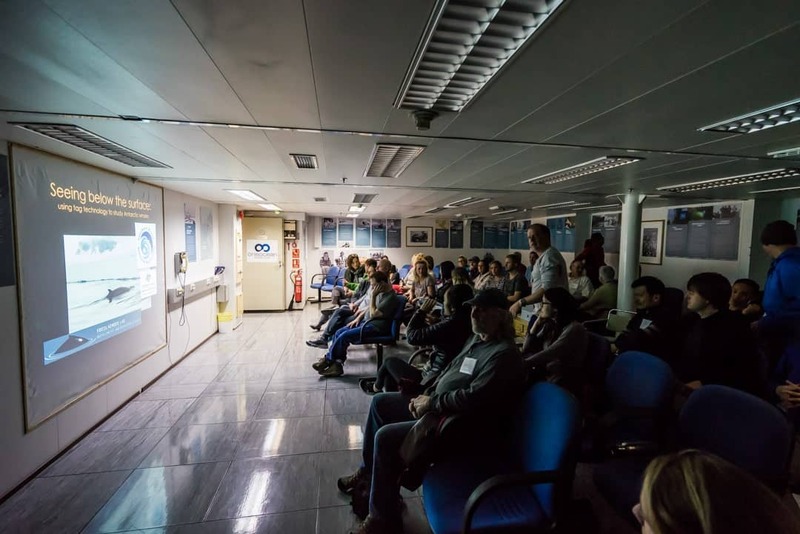 The presentation room on the Akademik Ioffe, where we learnt all about the history, wildlife and environment of Antarctica from a range of experts. 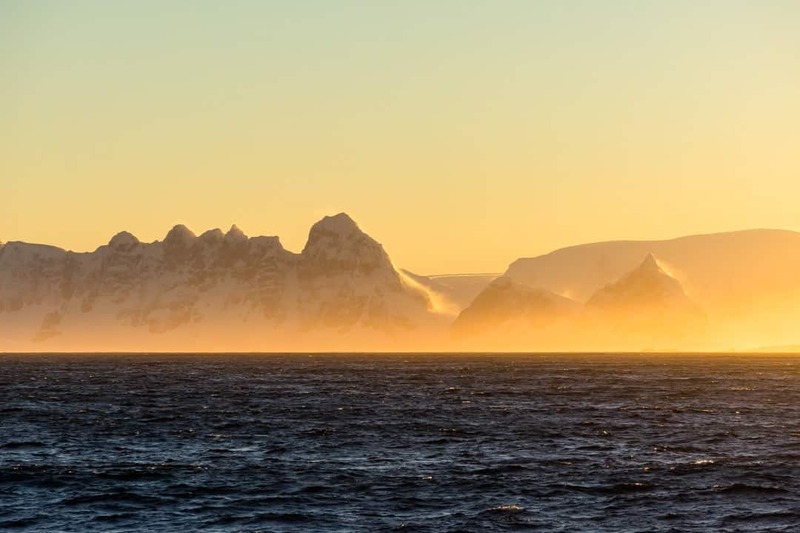 This was the moment we were all waiting for, and after two days of sailing we arrived in the Antarctic Peninsula. Once we had charged through the storm the captain regulated the ship’s speed to ensure we would arrive at sunrise. We set our alarms for 4:30am and woke up with the sky starting to turn orange. Motion sickness, unnecessary fears and rough seas will always be worth beating in order to catch sight of your first Antarctic sunrise. Want an epic adventure now that you’ve arrived? Definitely try kayaking in Antarctica! The first two days were actually the last time we would experience rough seas. The waters of the Antarctic Peninsula are completely protected, so there’s no rocking movement at all. Seasickness was just a distant memory. On the voyage back we actually had what is known as the “Drake Lake”. For the entire crossing, we had no wind and calm seas. The name matched the environment perfectly. Since we have returned we have discovered that the “Drake Lake” phenomena is actually more common than we first thought. We have met a lot of people who have made their own Antarctic expeditions and had calm weather the entire time. We’re glad we got to see a glimpse of what the Drake Passage can do, but having no swell or wind on the way back was a wonderful gift. The reputation of how rough the Drake Passage can be enough to scare potential travellers from making the crossing to Antarctica. We are here to tell you not to worry, as it’s not as bad as the reputation makes it out to be. 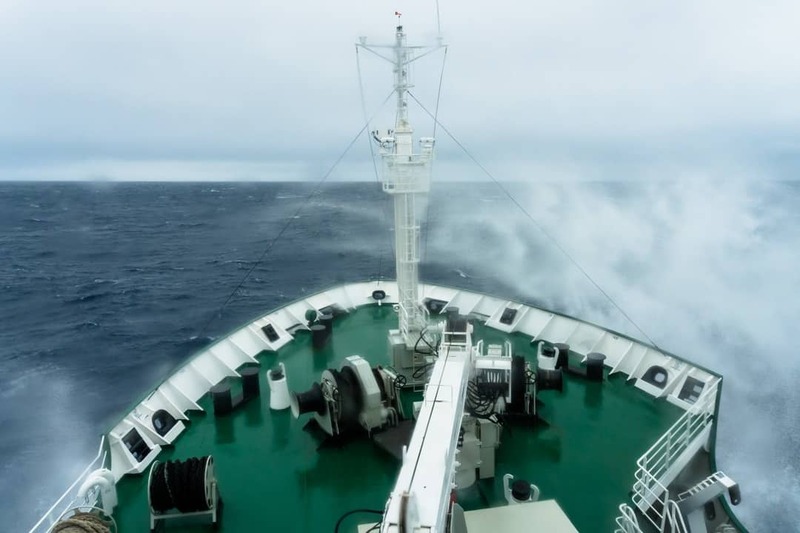 Still, there are a few tips that we would like to give to help your journey across the Drake Passage go as smoothly as possible. Bring lots of seasickness medication with you. Even if you’ve had experience on long ocean crossings, there is always a chance you can feel the effects of motion sickness. Take preventative treatment such as Dramamine and Benadryl. Drink lots of water. It’s important to stay hydrated, especially if you are sick. Talk to the doctor. One Ocean Expeditions always has a qualified and experienced doctor onboard and they will have stronger medication than you can buy over the counter in a pharmacy. Our doctor even had injections to stop vomiting in severe cases, although this was not needed by any of the guests. Lay down. Being horizontal is one of the best ways to relieve the feelings of motion sickness. Eat food. Even though you feel sick eating can actually help. If you can’t make it to breakfast, lunch or dinner don’t worry – the crew make regular rounds of the cabins to make sure everyone is feeling ok, and if you can’t get up they will bring you food (or crackers at the very least if that’s all you feel like). Attend as many of the presentations as possible. They will help pass the time and provide a much better experience for your expedition. Don’t be scared. If the seas are too wild the captain will either postpone the journey or take a longer route to minimise rock. But if you’re with sailing One Ocean Expeditions and their fleet of Russian research vessels, you will be in the safest hands possible. Our journey to Antarctica was done in partnership with One Ocean Expeditions. All thoughts, opinions and hours spent staring out at the Drake Passage are, as always, our own. One of the officers in the bridge. Now I got one more item to check on my bucket list. The list is getting longer after reading ispiring stories like this. What is the cost involve if you don’t mind sharing? Going through Drake passage in a few days. Ive been monitoring the weather there. Your blog really helped. I’m going to Antarctica in a few days too. I am in El Calafate now and leave for Ushuaia tomorrow. My cruise is on Jan 30. Loved reading your blog. We are heading on our Antarctic adventure in November with Cruise Norway on the MS Fram. We are just so excited as it has been on our list for years…..we will be celebrating my husband’s 70th birthday whilst we are away so it really will be a trip to remember. Wow guys this looks like such an incredible opportunity! Living in Tasmania I always feel geographically close to the Antarctic but it is basically impossible to get there from Australia as a traveller. Ushuaia is by far the best option when I make it to South America. Thanks for the tips and inspiration — definitely hope to make it down there. Hi Lucy, thank you for reading. There is a boat that goes from New Zealand (i think) but it is a long time to reach Antarctica. Do not miss this amazing experience when you are in South America. Some people say it is a lot of money, but it is so worth it and cheaper than other experiences in the world (gorillas in Africa). This is hands down the best trip we have ever done. We hope you get to experience Antarctica one day. Happy travels. The Antarctic sunrise looks great. Severely disappointed that this post doesn’t include a single photo of Jarryd losing his lunch over the railings. Yesssssssss that’s what I like to hear.